It is important that when purchasing a wheelchair the purpose for its need is satisfied. 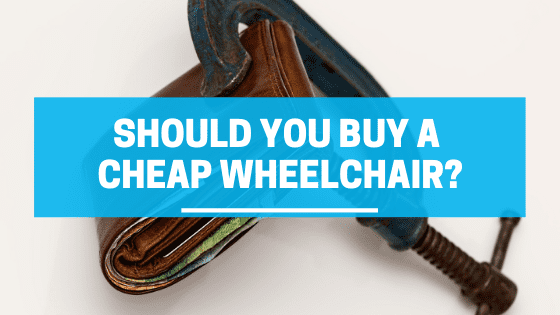 Many will look at the price when purchasing a wheelchair to save money but in the long run, the cost is greater when choosing price over quality. A quality wheelchair will cost more and in return will offer greater benefits. There are several things to consider while purchasing a wheelchair that will have an impact on your decision. The type of condition a patient has might determine if a wheelchair is an option, to begin with. Many can benefit from a wheelchair but unfortunately if it impairs the ability to operate the wheelchair it is best to have assistance. This would limit the person to a manually controlled wheelchair that someone can push. On the other hand, if conditions do not impair the operation of the wheelchair there are options to pick from. If the conditions of the person are permanent or long-term it might be best for an investment to be made to avoid higher cost in the long run. If a cheap wheelchair is bought chances are the quality of the frame, material, or electrical components will not last long and an additional purchase will be needed or repairment fees will add up. If the condition is temporary a cheaper wheelchair might be considered but there is an additional thing to consider before. The time of use on a daily basis is important to consider because comfort or technology that will improve posture like Karman Healthcare wheelchairs can be the difference between improvement or serious side effects such as backaches, spinal placement, and loss of energy. The environment in which the patient will be using the wheelchair is also an important factor to consider. The different type of wheels one can choose from are pneumatic, solid, or flat free which has different purposes. The thicker and textured wheels are best for outdoor use because it allows the wheelchairs to be used on multiple surfaces. On the other hand, thinner and smoother wheels will be best for indoor use. Electric wheelchairs are best for those who have a permanent or long-term condition that does not allow them to propel themselves as it will facilitate daily task and prevent fatigue when getting around. A manual wheelchair should be considered if there is an assistant available majority of the time and if the condition isn’t impairing of operation. The weight of the wheelchair is an important specification to consider as it can affect the mobility if its heavy and a manual wheelchair. Another reason the weight of the wheelchair is important is that when transporting, extra help can be needed to lift and store the wheelchair. Compatibility is an important feature to consider because if constantly on the go and have to store in an automobile it will make storing a breeze. Many wheelchairs are not able to fold up to fit into a car trunk so finding features like these can be beneficial. It also helps to store at home when it is not in use and will require the smallest storage area.